Nitrogen oxide emissions have been decreasing in states near Western North Carolina, and it is anticipated that they will continue to decrease in the future. This reduction will lower ozone exposures, especially peak concentrations from ground-level sources (primarily vehicles) and elevated sources (primarily coal-fired power plants). 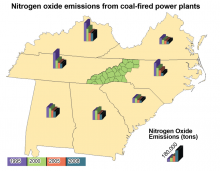 In a recent six-state analysis by the Southern Appalachian Mountains Initiative, nitrogen oxide reductions from ground-level and atmospheric sources were studied, one state at a time. Resulting ozone concentrations were then predicted for Joyce Kilmer-Slickrock, Linville Gorge, and Shining Rock Wilderness Areas (these three Wilderness Areas represent the range of responses to ozone reduction that could occur throughout Western North Carolina). Findings indicate that ozone exposures will be lowered if nitrogen oxides are reduced from both sources. However, the greatest benefit would occur if ground-level emissions of nitrogen oxides were reduced. Also, Western North Carolina would receive the most benefit if nitrogen oxide emission reductions occurred in eastern Tennessee, North Carolina, South Carolina, and Georgia. The major source of sulfur dioxide emission is coal-fired power plants. In 1990, the utility industry contributed about one-half of all nitrogen oxide emissions. 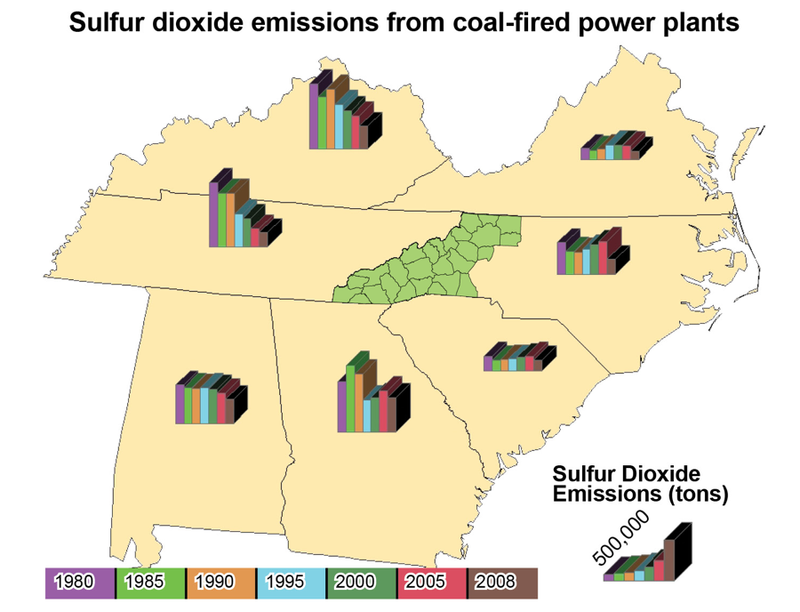 From 1980 – 2008, in states adjacent to the region, the implementation of various emission reduction strategies led to decreased emissions of both sulfur dioxide and nitrogen oxides. Additionally, from 1993 – 2008, the reduction in sulfur dioxide led to an overall reduction in wet sulfate deposition. In the same period, the annual wet nitrate deposition decreased, but the ammonia deposition from rainfall remained level or perhaps increased slightly. The Southern Appalachian Mountains Initiative conducted a study in 2002 to find out where air pollution affecting the region originates. Estimates were provided for three locations in Western North Carolina: Joyce Kilmer-Slickrock, Linville Gorge, and Shining Rock Wilderness Areas. Fossil fuel emissions from the states of Tennessee, North Carolina, Georgia, and Alabama are major contributors to visibility impairment and unsustainable acidic deposition in these areas of Western North Carolina. U.S. Environmental Protection Agency. “Emissions Monitoring, Clean Air Markets.” Accessed from: http://www.epa.gov/airmarkets/emissions/index.html. Southern Appalachian Mountains Initiative. “Final Report.” August 2002. Accessed from: http://nature.nps.gov/air/Pubs/pdf/SAMI_Final_Report_0802.pdf. USDA Forest Service, National Forests in North Carolina. “Air quality trends in Western North Carolina,” Jackson, W., personal communication, 2010. 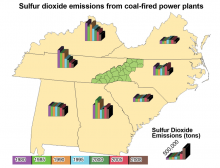 Sulfur Dioxide/Nitrogen Oxide Emission Maps: U.S. Environmental Protection Agency, 2002.